Henri Étienne Sainte Claire Deville was a French chemist, born 11 March 1818. Among his many scientific achievements, in 1849 he discovered anhydrous nitric acid (nitrogen pentoxide), which was the first of the anhydrides, a mono-basic acid. But perhaps his most important discovery occurred in 1855 when he successfully obtained metallic aluminium. He also worked out a method whereby large scale production of the metal could be achieved. But this isn't the whole story. 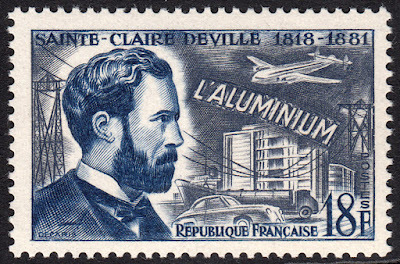 It seems that unbeknown to Sainte Claire Deville, a German chemist ten years earlier had already discovered aluminium. If only they had access to the net! That scientist's name was Friedrich Wöhler. Apparently there was no hard feelings, as they collaborated in 1857 and together discovered silicon nitride. On 7 March 1955 France issued a set of six stamps under the theme Famous Inventors. One of these stamps featured Sainte Claire Deville. The stamp was designed and engraved by Albert Decaris. I think this design is fabulous. Decaris has incorporated the various uses of aluminium over time in a most unique and effective manner. The combination of the streamlined car and interestingly shaped building in the background makes me think of the art deco period in the early 20's. And of course, I can't finish without mentioning yet another engraved beard for my collection!